[Todd Harrison] took a look inside the business end of the cruise control system from his 1994 Jeep Grand Cherokee. We were a bit surprised at how the system operates. 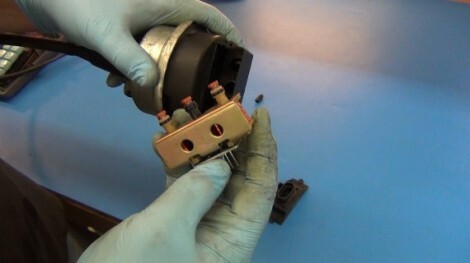 The parts seen in the image above make up the throttle control, using a trio of solenoids to vary the level of vacuum inside the device. We categorized this as a repair hack, but [Todd] is just rubbernecking and doesn’t have any real plan to fix the system. It’s been on the fritz for ten years and this piece may not even be the culprit. But we’re still satisfied because he gives us a look at the system which uses the amber-colored stoppers on the three solenoids to plug three different sizes of weep holes. The unit is a vacuum enclosure where a throttle wire connects to a rubber diaphragm and adjust engine speed as the diaphragm moves. The vehicle’s computer actuates the three solenoids, allowing leakage to vary the level of vacuum, thereby keeping the throttle at just the right level. Neat! Maybe not Modern enough but my 2002 Dodge Ram Diesel Auto is still Vacuum controlled, the 2002 manual is electronically controlled. Go figure. And of course really modern (gasoline-powered) vehicles don’t even use the airflap (throttle valve) but instead advance or delay intake valve timings in addition to modulating injection patterns to control power. Go figure. What vehicles use this approach? I’d love to read more about it. OK I’d REALLY like to see a gas engine on a modern vehicle that actually uses this technology (valve modulation to control throttle) as I am a mechanic. The air flap as you call it is called a butterfly and I think you would find that it is still in 100% use on gas powered cars.I’m not talking about some futuristic prototype that is still deep in r&d either. I mean we’ve only recently introduced direct injection into the mix. The throttle butterfly is usually wide open and kept only as a failsafe. From that article, it seems other manufacturers are using such tech also. codenamegamma: There are a number of cars these days running on valve/cam based throttling, search for Fiat multiair for one of the more mainstream examples. It’s not “really modern” vehicles, but rather some selected manufacturers and models. Toyota had VVTi for a long time, but systems like that have major drawbacks. I’d like to see you change a camshaft on a valve-controlled engine and the camshaft of a “regular” butterfly-controlled one. And even more really modern vehicles are electric and don’t have any valves. Vacuum based cruise control. Used for 10-20 years, 80s and 90s. Was first electronic cruise control. 1994 may have NTSA OBDII on the computer control, which includes cruise control. I have the factory manual for Jeep cherokee which explains all electronic and mechanical and goes deep into the computing and transmission shift control, etc. Wish i had it with me now and post some relevant stuff. cruise control knows engine RPM, throttle amount, gear engaged, ground speed, and logically makes every step to increase/decrease speed, and shift gears with all necessary steps like disengage clutch, etc. My manual even has the baud rates for the OBD, the serial codes and all that. The 94 Jeep Grand Cherokee was still running on the Chrysler SBEC III ecu which is OBD I. The JTEC (Chrysler’s OBD II ECU for the late 90’s) ecu didn’t make its way onto that vehicle until 1996. Usually not on the nay-sayer’s team, but I’d really prefer you all not go hacking up cruise control systems on your cars. Things in this world are dangerous. Get over it. In my experience, the main control units for the Cruise Control were never really the culprits. The usual suspects for a failing or intermittently working cruise system were the vacuum hoses. They would dry out and develop small leaks at the ends, and they would fail. Now hack in range finding to add automatic adjustments for the driver ahead of you who can’t hold a steady speed. I’ve wanted to do this for a while! My current vehicle has no factory-installed cruise; it was only a dealer-added option, so it’s tempting to buy the kit and see what I could manage. I want to be able to hit the “follow at a safe distance” button and only have to keep it between the lines… Luxury. I concur! It is not usually the main control module. Being a professional mechanic, I would venture to say that ~70% of the time it is really, really simple, like the brake switch is worn or out of adjustment. Some GM cars today will disable the cruise control if the check engine light is on also…..
Google “Bosch Automotive Handbook”. Its a little blue book, that is absolutely packed with fantastic information. I have the seventh edition, and I use it all the time. It has sections on adhesives, comfort systems, math, physics, control systems, communication systems, ….. etc. Hook the solenoid rig up to a microcontroller and create a break dancing (well, hopping) robot! Really? Nobody else noticed that the cruise hasn’t worked for 10 years…on his 1994 car…in 2012? Those old vac units really sucked, glad we have progressed to electronic throttles that can malfunction, go wide open, and kill anyone too stupid to figure out that turning the key will make the engine stop. Yes, there were never, ever, in the history of the internal combustion engine, any mechanical throttle assemblies that have stuck open. Very valid point. There are also no other safety measures on modern engine management systems, like ignition timing reduction, spark and fuel cuts, etc. when the throttle control is outside of parameters. The news reports you’ve likely seen have definitely got all the facts spot on. Assuming you have a car that has one of those old style turning keys. My car won’t cruise below 35mph. Why don’t you “Hack” a cruise to run slower than that. That would be cool.